Welcome to mvstat.net, a subset of cyberspace dedicated (mostly) to the exciting, deep, abstract, useful field of multivariate statistics. Whenever we take more than one measurement simultaneously, we have multivariate (or multidimensional) data, and one of the most effective techniques for investigating the structure of these types of data is multivariate statistical analysis combined with computational methods. 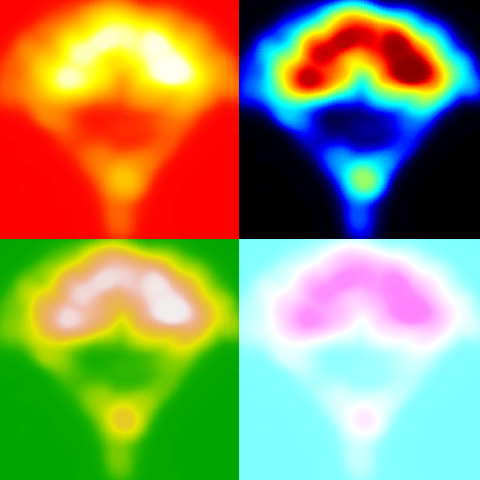 In the image are maps of the probability distribution of the bivariate (or 2-dimensional) locations of sub-cellular entities inside a constrained mammalian cell, shown in four different colour schemes. In addition to the scientific value of multivariate analyses, there is an aesthetic appeal to their visualisations too. "It is more probable that a poet who knows what the Gaussian (or bell) curve is writes better love sonnets than one who does not." Fernando Pessoa (1888-1935), Poetry and Culture.